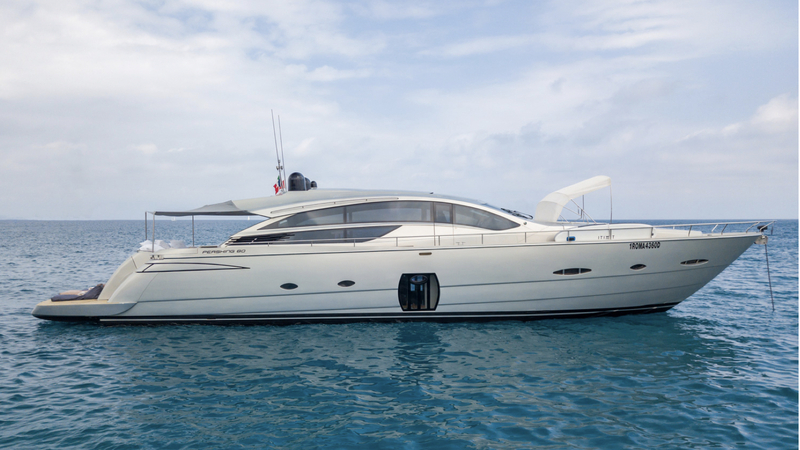 One of Pershing’s popular Pershing 80 open models For Ever is built for speed and cruises at 33 knots, reaching an impressive maximum speed of 48 knots, powered by her low-hour twin MTU 16V 2000 M93 engines. Perfect for zipping effortlessly between destinations, For Ever sleek profile moves fast through the water carrying her guests in style and comfort. Indoor-outdoor living is at the heart of For Ever’s design, with exceptional flow between exterior and interior spaces. A clean, contemporary interior is complemented by an abundance of natural light thanks to signature large windows throughout the yacht. The main deck houses the large main saloon, with stylish Wenge flooring, lounge seating and a full entertainment system including a pop up TV, formal dining table and the helm station with three Poltrona Frau leather seats. Accommodation is located on the lower deck and numbers four guest cabins and two crew cabins, with For Ever able to welcome eight guests on board. Guest cabins are generously proportioned and include the master, located amidships, the VIP, located forwards, and two twins. The master is particularly spacious, with large windows and a big ensuite. The main saloon is connected the main aft deck by glass doors which are able to retract completely to completely connect these two spaces. The main aft deck features a second main dining space, sun pads, and lounge seating and leads easily down to the transom and swim ladder. A second large outdoor space for relaxing and enjoying the surroundings, with U-shaped seating and sun pads, is easily accessed on the bow. The Bow has a manual Bimini sun top, allowing complete flexibility for shade or sun as required, and an extendable/retractable top on the cockpit also brings the outside in.